Located in Southern California’s San Gabriel Valley, ten miles east of downtown Los Angeles, San Gabriel Unified School District educates more than 6,000 kindergarten through twelfth grade students on a traditional calendar schedule. Established in 1781, the San Gabriel Mission was the fourth California mission and is considered the birthplace of the Los Angeles region. San Gabriel Unified School District was founded in 1868 and is proud of its long tradition of academic excellence. The district is currently comprised of five elementary schools, one middle school, one traditional high school, and one continuation high school. Our student population is approximately 1% African-American, 50% Asian, 4% Caucasian, 3% Filipino, 37% Hispanics, and 5% Others. The San Gabriel Unified School District has approximately 289 certificated, 30 management, 242 classified, and 5 confidential employees to support our students. 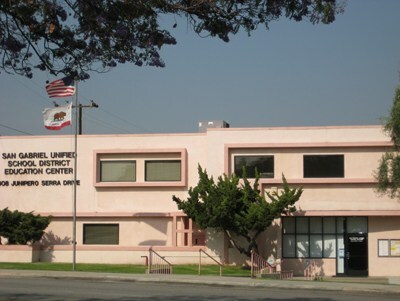 The San Gabriel Unified School District offers many educational opportunities to our students including our English Language programs which provide supplementary assistance to grade K thru 12 students who arrive in San Gabriel knowing little or no English. The San Gabriel Unified School District is fortunate to have exceptional parent support and organizations such as San Gabriel Educational Foundation (SEF). The San Gabriel Unified School District boasts a long-standing record of excellence. Most of our comprehensive sites are Distinguished Schools. Our 514 employees are commited to the furtherance of this achievement; we make a significant investment each year in the professional growth and development of teachers and instructional service personnel to continue to raise the bar.